Today marks the start of the school term, a bittersweet time where the kids head back to a new year of learning and parents readjust to having no children around. 2016/17 was a great holiday but after six weeks off both kids and parents are ready for the school term to begin. The cost in economic terms of NZ's long summer school holiday must be quite large, perhaps offset in GDP terms by increased spending on travel, accomodation and holiday activities but in terms of a productivity hit for a family run business such as NZ Fine Prints the school holidays are a bit of a trial. Business is reduced to the bare minimum of getting prints shipped out the door, there is no spare time for planning, cataloguing or dealing with artists - anything outside of the ordinary is pushed forward into late January when we are back at work without the children under foot. Looking back the family memories of the holidays are will be a big bunch of good times but we have really tried the patience of some customers along the way - but what alternative there is to tag team parenting reduced to part time hours over the school holidays eludes me. Back to school is also part of what NZ Fine Prints are doing in 2017. Pre-internet we had a division of our company devoted to supplying NZ schools with art education materials, particularly large colour reproductions of famous paintings. This part of our business has reduced to a fraction of what it was now that teachers can access colour images over the internet for classroom use, basically we ended up selling school teachers with discounted prints for their homes rather than providing educational resources for the classroom! We still think that kids growing up should be surrounded with good quality prints of paintings that are more than the purely decorative, to learn about art history and to appreciate what a rich visual culture has been created by artists over the past 500 years but we no longer import a purely educationally focussed range of prints. 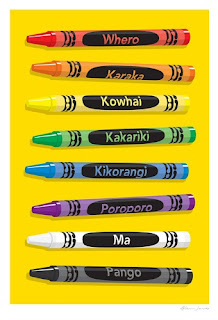 Posters and prints will always be on walls of kiwi kids classrooms so we are expanding the prints for children/kids art collection in 2017 to include educational posters such as NZ and world maps (including NZ map posters in Te Reo Maori), and we're adding some great kiwiana ABC posters for the pre-school learners as well.